The Cash Cannon plans to bring an exciting and unique celebratory project to the mass market. Use this product to distribute paper items in a exciting but controlled motion. Distribute special promotional items to your patrons in order to keep them coming back to your venue and to boost sales. And when that all fails, it never hurts to make it rain with a little cash. 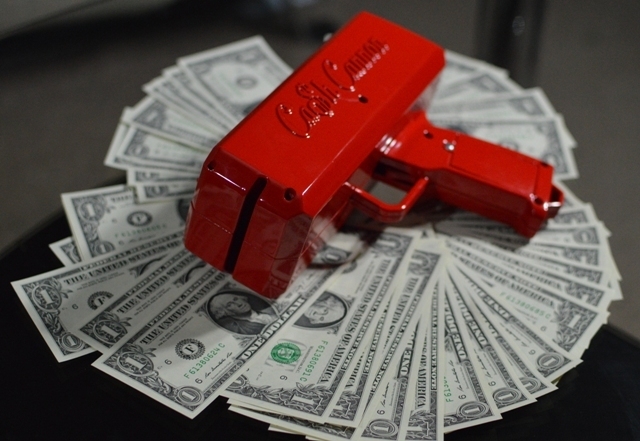 The Cash Cannon is a toy that dispenses paper items in a rapid but user controlled manner. The preferred item of choice to dispense is of course cash but any item that fits in the loading compartment and out of the slot will work with the device. The Cash Cannon is the first device that performs this function and is simple enough in terms of design to be mass manufactured for the public use. It’s a simple as it can be. Lift the top cover open, place the items in the loading compartment, and pull the trigger. Make sure you aim in the direction you want the items to be dispensed. The device uses a simple motor and rubber roller assembly that causes enough friction to move us dollar bills and other items smoothly out of the slot. The ergonomic handle gives the user a good control of the loading compartment and the direction the items are released in. The squeeze trigger allows the user to control the frequency at which the items are dispensed. And to top it all off it operates using just one 9 volt battery. What can you do with The Cash Cannon? Of course the primary use of The Cash Cannon is the dispense US dollar bills in an easy and unique fashion. 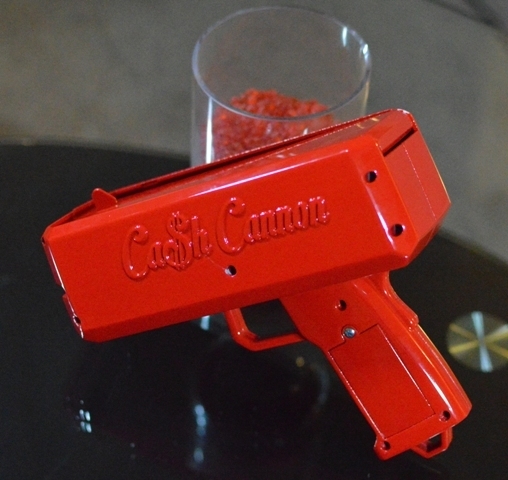 You can also use The Cash Cannon to dispense a promotional flyers or even a deck of cards and make a game out of it. You can use your imagination for uses of The Cash Cannon and have fun. Whatever you can fit in The Cash Cannon that is similar in structure to US dollar bills will fly out. The Cash Cannon is a simple and easy to use device. It can be loaded with US dollar bills or any item that is similar in structure. Made of ABS plastic and engraved with the cash cannon logo on one side, with an open space on the other side for you to add your own logo or design. Also what notes will it take? Would it take Monopoly money?